To maintain the most efficient processing facility AND keep recycling programs available, it is important for our customers to know what is acceptable and what is NOT. **You No Longer Have to Sort. To prepare your items to be recycled, please rinse out containers to remove as much of the food residue as possible. No need to discard plastic lids and caps (leave them on the bottle) on plastic bottles, but do discard pumps on bottles. *One example of what is NOT acceptable would be ANY metal other than Aluminum and Tin cans. DO NOT put steel items such as a horseshoe, fencing, or other steel items in your recycle bin. *Plastic bags of all types are not recyclable in the program. Bags can cause problems for the recycling screens. Please do not put recyclables in plastic bags. *Containers with excessive fluid in them aren’t recycled. Please empty plastic bottles prior to placing them in your recycling bin. Download the route map , to find your pick-up day. 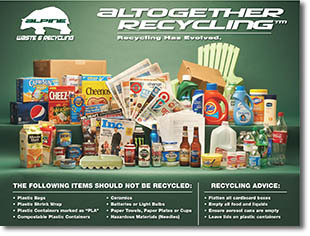 For a complete list of recycling & disposal options, visit the Recycling & Disposal Centers page. A dedicated phone line for Golden residents. Please call 303-277-TRASH (8727) to speak with one of six customer representatives, trained to be able to answer questions specific to Golden’s program. Automated sustainability reports, exclusive to customers, which track diversion rates and allow comparisons to other households in the area. At Alpine’s Altogether Recycling facility, 3-7 plastics and aseptic (milk) cartons are accepted, and they are currently the only company in the market to accept rigid plastics in its program. Cleaner-burning compressed natural gas (CNG) trucks with real-time GPS routing software for efficient drive times. A new Compost program, open to ALL households in Golden. As of September 1, 2018, rates have changed for the City’s Waste & Recycling Program. Although rates have remained the same for three years, City Council approved small fee adjustments to accommodate a service contract increase (3%) and an adjustment to maintain a supply of carts for all homes. The City administers the contract which is re-bid every five years and passes the charges on to each homeowner through the water utility bills. Some homes will receive a decrease, while others will see slight increases. In addition, to incentivize households who choose to recycle more, City Council decided to waive the $25 cart delivery fees for homes that request a change to a smaller trash cart. 1. Who should I contact to change service or report service or billing problems? Please contact Alpine Waste and Recycling at (303) 277-TRASH (8727) or email them at golden@alpinewaste.com. 2. Can I put yard waste or recyclables or plastic bags in my trash cart? Yes, however, since this is a volume based program, any material that will not fit into the cart that you want collected on your next trash collection day must be in a 32 gal. or smaller plastic bag with a prepaid sticker on it. 3. Are there guidelines for how my trash and recyclables should be prepared for service? Place trash in plastic bags and tie them closed. Unfortunately, plastic bags are discouraged from use in the recycle carts because they become stuck in the machinery that is used to sort recyclables. Place a paper bag or two filled with heavier recyclables on top of the other recycle cart contents. This helps to contain loose papers and lighter items below the bag. Cardboard can also be used, but care must be taken not to wedge it in place so tightly that it does not allow the contents of the cart to fall into the truck. Make sure the lid sits flat and is completely closed. Do not over fill the trash or recycling cart as even if it is slightly cracked open, wind is more likely to enter and cause the lid to open completely. Do not place the carts out for service the night before they are serviced if wind is anticipated. Try to minimize the amount of time the cart is exposed to the wind. 4. I have a large item(s) (couch, tree limbs , rolls of old carpet, etc.) that I would like to have removed from my house. The item is too big to fit in my trash cart, so what options are there to throw it away? The easiest, most efficient way to dispose of a large item is to call Alpine Waste (303-277-TRASH) to arrange for a large item pick-up. The cost of this service varies according to the item(s) or the volume of material you want to have picked up. Residents are not prohibited from calling any trash or junk hauling company to have large items removed. Residents may also haul items to a local landfill or transfer station for disposal. Finally if you have the time, tools and determination, large items (excluding hazardous and other prohibited materials) may be cut up into smaller pieces and placed in your regular trash cart or plastic bags with prepaid stickers for disposal. 5. 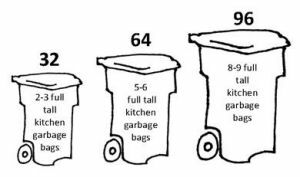 What are the dimensions of the trash and recycling carts? 6. What are the fees for this program? Your monthly price depends on the size of your garbage cart: 32, 64, or 96 gallons. How big are they? 7. What does the service include? The price for each service level includes your choice of three trash cart sizes (32, 64, or 96 gallons), a 96 gallon recycle cart and twice-annual pickup of yard waste. 8. What optional services are available? Customers may choose to add green waste collection, large item pick-up, or drive-in service for an additional fee. 9. How will I be billed for service? The City charges for three months of service on your quarterly water bill. Optional services will be billed directly by Alpine Waste. 10. What if I change my mind and want a different size cart for trash? Alpine Waste will provide you with one cart exchange, free of charge, within the first 90 days of service. 11. What if I want a different size recycling cart other than the 96-gallon cart provided? You may select a 64 gal. cart for your recyclables. Please check the option for a 64 gal. recycle cart on the enrollment form or be sure to tell the Alpine Waste customer service representative you would like the smaller size. If no selection is made, a 96 gal. cart will be provided to allow households to recycle as much acceptable material as they like. 12. I am in a Homeowner’s Association, is my house included in the program? If your HOA contracts with a waste company to provide service to all of the households within your neighborhood, you are not included in the city program, although your HOA may voluntarily opt into the program at any time. If your HOA does not provide waste collection, your household is included in the program. 13. Can my multi-family complex still use dumpsters? Multi-family complexes may elect to use all carts, a dumpster for trash and recycling carts, or two dumpsters (one for trash, one for recycling). Pricing will be equivalent to the three main service levels. 14. Can I still contract with another company for service? Yes, residents may hire any waste hauler, licensed to operate within the City. However, if your household is included in the City waste program, you will still be billed at the minimum level of service. 15. What if I have more trash than usual? Additional bags of trash will be collected when a pre-paid sticker is affixed to each bag. 16. Where can I purchase the pre-paid stickers for my temporary extra trash? Stickers will be available for purchase by visiting City Hall. 17. What if my home is vacant? Can I discontinue service? No, in order to maintain the lowest possible pricing, each household in the program will be billed for monthly service. You may request the 32-gallon level of weekly service if your home is vacant. 18. What day will my trash be picked up? Please see the collection route maps for the trash collection schedule and recycling collection schedule. Recyclables will be collected on the same day as your trash. 19. When did Golden adopt these trash and recycling policies? On May 13, 2010 City Council approved Ordinance No. 1868, now codified as Chapter 4.82 in the Municipal Code, changing residential waste collection services in Golden by allowing the City to contract for waste and recycling services for low-density residential properties. Golden was originally chosen as the territorial capital of Colorado in 1862.